Close to the edge: Keith Levene reviews the Yes guitarist’s incredible solo output. When I was 17, I co-founded The Clash. The ‘only band that mattered’ was on the path to fame and fortune. Then I left. Why? I blame Steve Howe! At the age of 15 I’d roadied for Yes. I experienced a world-class guitarist and band up close night after glorious night. When you’re used to the best, you want nothing less. Later on, I therefore endeavoured to integrate prog and post-punk-type sensibilities (and synths!) with The Clash, but it was a thankless task. 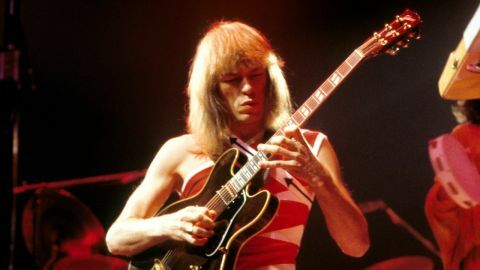 Unfortunately, Steve’s early collaborations with Yes are not found in The Steve Howe Anthology. This new release, however, does offer 33 tracks representing Steve’s later material, several of which are 2015 remasters. Anthology provided a few surprises. I got a bit emotional over Sensitive Chaos. This tune immediately struck me as a lost classic Yes Album hit featuring those traditional Steve Howe note-roll cascades that only Steve can pull off. Yes had a definite direction from the start, but it took Steve’s arrival for everything to gel perfectly. I was unaware that Steve released an album of Dylan covers before now. His interpretations of Just Like A Woman and Buckets Of Rain appear here. Meanwhile, on Diary Of A Man Who Disappeared (Vanished), Steve’s natural ability as an acoustic guitarist, which was one of the main things he originally brought to the table, shines through. Steve was to guitar what colour TV was to the old black-and-white world that stretched back behind him. He was immediately interesting thanks to his range within his instrument. Steve’s awareness of the importance of the acoustic side of music in a post-Beatles world polarised and further expanded his unique electric style. Anthology’s traditional, classical Mood For A Day showcases Steve’s incredible and unique range, which nobody else was demonstrating when he arrived on the scene. Steve had the intelligence and vision to appreciate what had been around before and, more significantly, what could be done in the future. Additionally, he possessed the self-belief to explore these new areas. No disrespect to any other guitarist, but I’ve seen many people pull off a Hendrix or a Santana or a Van Halen quite competently. I’ve yet to see anyone do the Clap or Sound Chaser like Steve.